SOFTWARE THAT DELIVERS CLEAR ANSWERS. Sound Metrics software is designed to help users get the most functionality out of their imaging sonars. 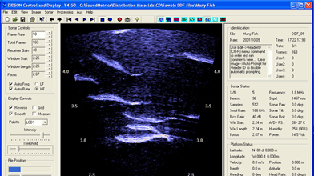 Topside display provides a clear, easy-to-understand image of what your sonar is "seeing". Convenient toolbars make it simple to use those functions that control the sonar and present the data in its most useful way. Sound Metrics is continually upgrading the software’s versatility. Functions like background subtraction, motion detection, auto counting and target sizing offer more than just a picture of your data. Custom software solutions may be tailored to meet your needs. Software puts you in full control. Easy access to the functions you most need.